News You Can Use – 7,000 JetBlue Points, Free Movie Ticket With Visa, 500 Easy Southwest Points, & More! One Mile at a Time reports, new members can earn 7,000 JetBlue bonus points. To earn the points. sign-up for JetBlue frequent flyer account (through this link), book a paid flight on JetBlue, and travel by June 18, 2015. JetBlue points are worth ~1.4 cents per point. So the 7,000 points you earn are worth ~$98. If you find a good price on a 1-way flight, you may come out ahead! 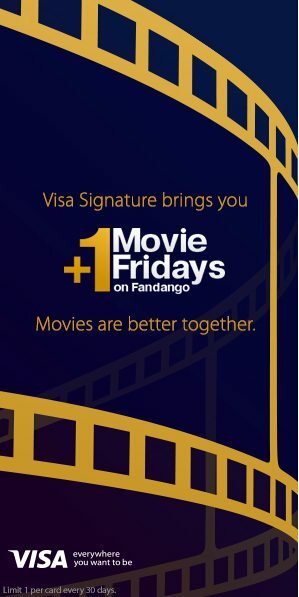 Via CreditCardWatcher, buy 1 movie ticket and get 1 free at Fandango with your Visa Signature card. You can tell if your card is a Visa Signature card, because it says “Signature” under the Visa logo. You can get this deal each Friday starting at 12:01 am Eastern Time and ending Saturday at 5:59 am Eastern Time, through August 21, 2015. To get your free ticket, add 2 or more tickets to your cart and the lowest priced ticket is free. Via FatWallet, you can also buy $1 tickets to select family movies at Regal Cinema box offices this summer. All movies start at 10:00 am. The Lounge Club benefit that comes with the Chase Ink Bold (no longer available), Chase Ink Classic (no longer available), and Chase Ink Plus is coming to an end. Get Your 2 Free Lounge Club Visits Before This Benefit Is Gone! The last day to sign-up is April 30, 2015, (today!). Your membership is good for 1 year. And folks who already have a Lounge Club membership, can still use this perk through the expiration date on their card. Some Southwest members can earn up to 2,000 Southwest points for referring friends. Check your email to see if you’re targeted. You’ll get 500 points for each new member (up to 2,000 points) who opens a new Southwest frequent flyer account through your link, by June 2, 2015. And your friends will receive 250 Southwest points for signing-up. Know Folks Who Don’t Have a Southwest Account? You Can Earn Up to 2,000 Points for Getting Them to Sign-Up! You’ll receive the bonus points in your Southwest account, by June 17, 2015. Unfortunately, the points you earn will NOT count towards the Southwest Companion Pass. But earning the bonus WILL prevent your points from expiring for another 24 months! You can save 50% on award stays at certain IHG hotels in the Caribbean, Central America, and Mexico. This deal is good for bookings made between May 1, 2015 and May 8, 2015, at 12:00 pm Eastern Time. Stay from May 1, 2015, through May 31, 2015. The InterContinental Cancun is a hotel that will cost more points after May 1, 2015. But you’ll still save 50% off the original price of 25,000 points per night. Stay at the InterContinental Cancun for Only 12,500 IHG Points per Night! You can use your Southwest miles to get (almost) free flights to some of these locations. And if you have the Southwest Companion Pass a friend flies with you for close to free! If you live in the southern US, you may save by using British Airways Avios points for American Airlines or Alaska Airlines flights to your destination. Or check sites like Expedia and Orbitz for cheap paid flights. This is a great excuse for a spring beach vacation! Thanks for the heads up on the buy 1 get 1 movie tickets deal through Fandango and Visa Signature! I’m wondering a bit about the limitations though; specifically, how does the only registering 1 email address every 7 days limit the benefit? If I’ve got 5 Visa Signature cards, does that mean I can basically get a BOGO movie ticket every Friday until August 21st?